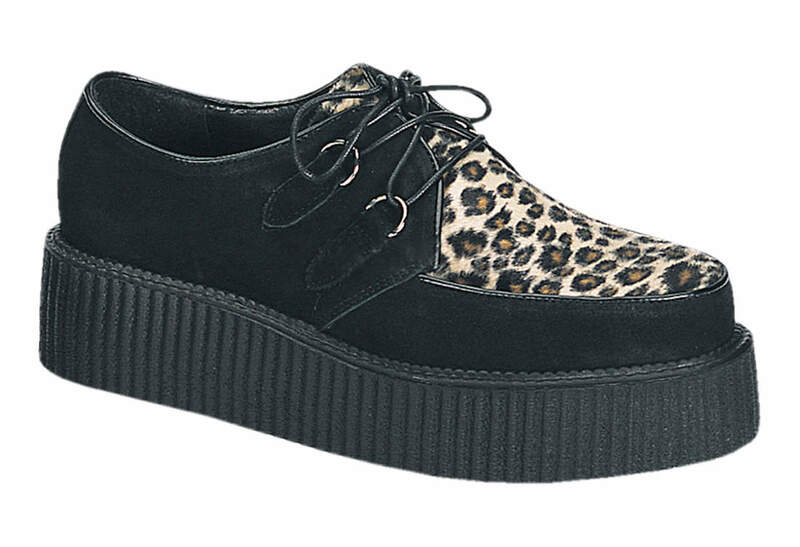 The Creeper-400 is a handsome black suede creeper with soft cheetah print fur on top. 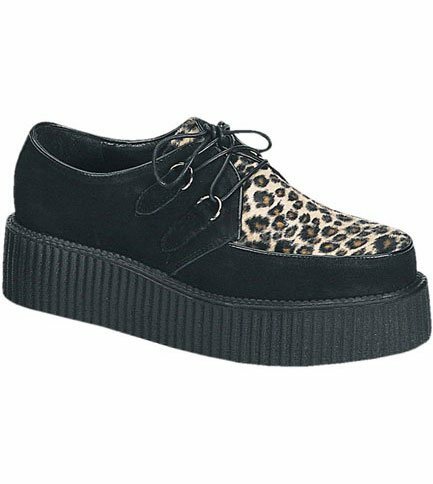 They come with a four D-Ring lace-up and a two inch creeper platform. Great for wearing out on the town or just hanging out with friends. Very good! A little too big but thats my fault because I ordered them too big(a 10 1/2 isnt avaliable) so I just put the tissie that was in the shoes and packing them in and they are fine. Secret stash place under the soles. These are, by far... the coolest shoes in the world!!! They are comfortable, make you about 2 inches taller than barefoot, and there's a hollow spot in the sole, with a cute little casket on a string. You could probably put... uh... stuff in it. The shoes are by demonia, the soles aren't as comfortable as i'd like, but still an excellent shoe. Laces are thin, but the shoe isn't designed for being too tight around the foot. So it's functional. Much more comfortable than a hard leather doc marten.